St. Martin's Press, 9781137278562, 320pp. For twelve years Robert Blecker, a criminal law professor, wandered freely inside Lorton Central Prison, armed only with cigarettes and a tape recorder. The Death of Punishment tests legal philosophy against the reality and wisdom of street criminals and their guards. Some killers' poignant circumstances should lead us to mercy; others show clearly why they should die. After thousands of hours over twenty-five years inside maximum security prisons and on death rows in seven states, the history and philosophy professor exposes the perversity of justice: Inside prison, ironically, it's nobody's job to punish. Thus the worst criminals often live the best lives. 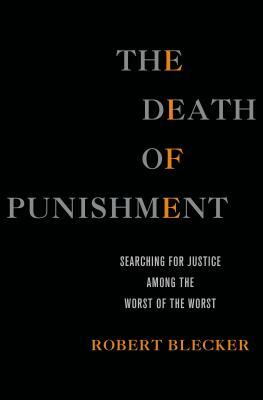 The Death of Punishment challenges the reader to refine deeply held beliefs on life and death as punishment that flare up with every news story of a heinous crime. It argues that society must redesign life and death in prison to make the punishment more nearly fit the crime. It closes with the final irony: If we make prison the punishment it should be, we may well abolish the very death penalty justice now requires. Robert Blecker is a professor at New York Law School, a nationally known expert on the death penalty, and the subject of the documentary "Robert Blecker Wants Me Dead." He formerly prosecuted corruption in New York's criminal justice system as a Special Assistant Attorney General and has been the sole keynote speaker supporting the death penalty at several major national and international conferences. A post-graduate Harvard fellow in Law and Humanities, Blecker wrote a stage play "Vote NO!" which premiered at the Kennedy Center. Profiled by the New York Times and Washington Post, the subject of a USA Today cover story, and recently featured on ABC Nightline, Blecker frequently comments for national media, including the New York Times, PBS, CNN and BBC World News. He lives in New York.